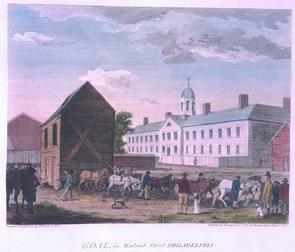 Richard Allen's Bethel A.M.E. Church being moved, with Walnut Street Jail in background, ca. 1794. Mother Bethel Church began in a blacksmith's shop, which Allen purchased and moved to a lot on Sixth Street in Cedar Ward, a black neighborhood. "The City of Philadelphia : in the State of Pennsylvania North America : as it appeared in the year 1800 consisting of twenty eight plates" / drawn and engraved by W. Birch & Son.